When Annamarie invites me to her home for cake, I drop everything. I know the cake will be sublime, and her recipe well-tested and flawless; she spares no detail to assure you won’t fumble. The finest cakes are often the centerpiece of celebrations, so it’s critical that the recipe be well-organized and easy to follow. 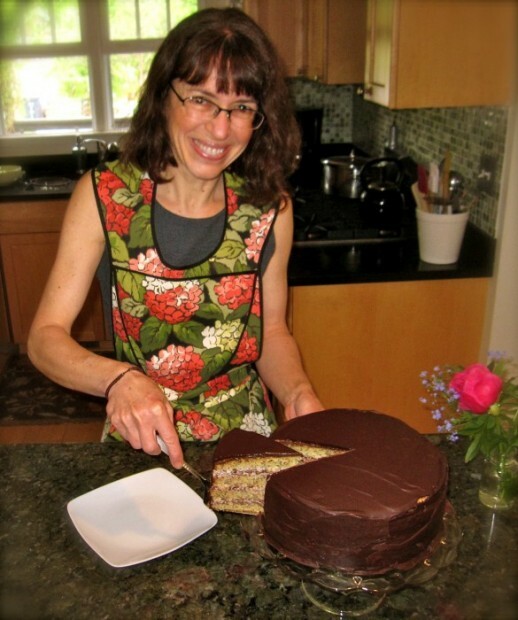 Annamarie tells me this is a sturdy cake, travels well and serves up to 20 guests. The following recipe makes a 9-inch round cake. It may also be made in a sheet pan, then sliced into rectangles for layering, or the recipe doubled and baked in 12-inch cake pans to serve a large crowd. She plans to make the cake layers in four, half-sheet pans for a graduation party soon. Annamarie waited tables at The Earle restaurant in downtown Ann Arbor in the late 70’s and early 80’s. Two popular desserts were a cassata and a poppy seed cake, and she says this Chocolate-Poppy Seed Cake tastes like a combination of the two. Annamarie’s Strawberry-Rhubarb Cake and Lemony Wedding Cake are other delicious recipes for cakes she’s shared with us through the years. Advance planning: Creme Fraiche must be started at least 36 hours in advance. Cakes should be refrigerated several hours prior to assembly. Cake may be made up to 24 hours in advance of serving. In medium bowl, stir sour cream, whipping cream and sugar until the sugar dissolves. Cover and let stand at room temperature until thickened to the consistency of sour cream, about 24 hours. Stir and refrigerate créme fraiche for at least 12 hours. When creme fraiche is ready, melt 14-16 ounces of chocolate in top of double boiler over simmering water, stirring until smooth. Remove from over water and cool to room temperature, about 20 minutes. Whisk chocolate into créme fraiche. (The cold cream fraiche will cause the chocolate to harden into delicious strands and small chunks.) Mix in the orange peel and liqueur. Refrigerate until ready to use. Grease two nine-inch cake pans. Line pans with parchment rounds, lightly buttered. In a small bowl combine the poppy seeds, orange peel and buttermilk. Let stand 15 minutes. Sift flour, baking soda and salt into medium bowl. Using electric mixer, cream butter and both sugars in large bowl until fluffy. Beat in yolks and vanilla. Mix in dry ingredients alternately with poppy seed mixture, beginning and ending with dry ingredients. Using an electric mixer fitted with clean dry beaters, beat egg whites until stiff but not dry. Fold into batter. Pour half of the batter into each of the prepared pans. Bake until a toothpick inserted into the center of the cake comes out clean, 15-20 minutes. Cool in pans on rack. Run a thin knife around perimeter of each cake; turn cakes out of the pans. For easy horizontal slicing, refrigerate cakes several hours before slicing. Gently heat cream in sauce pan. When barely simmering, stir in chocolate and turn off heat. Continue stirring until smooth. Remove the chilled cake from the fridge and spread a thin layer of ganache over the sides and top of the cake. Refrigerate 30 minutes to set the ganache. Slice each cold cake in half horizontally using a long serrated knife. Place one cake, cut side up, on a cake plate. Reserve approximately one cup of the créme fraiche filling. Divide the remaining filling into 3 equal portions. Spread one portion over the first cake layer. Top with the second layer and spread another portion of filling over the cake. Continue with the next layer and then top with the fourth layer of cake, cut side down. Take the reserved filling and spread it around the sides of the cake, pushing it between the layers if there are spaces that need to be filled. Spread any remaining filling on top of the cake. Use all the filling, preferably stuffing it between the layers and spreading it on the sides of the cake. Refrigerate cake until filling is firm, about 2 hours. The frosted cake can be refrigerated for several hours or overnight. Once the ganache has set, cover the cake loosely with plastic wrap. If the cake is very cold let it sit out for a couple of hours before serving. It is ready to serve when the ganache loses its frosty appearance and starts to look silky. Cut cake with a sharp knife dipped in hot water and wiped dry. 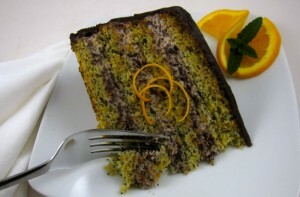 Optional Garnish: Decorate cake with oranges, mandarin orange slices (canned and drained), candied orange slices or thin strips/strands of candied orange zest.